. . . but because of the high prevalence of norovirus in our house (if you don't know what that is, I highly suggest NOT googling), I lost interest in operating my brain and I will instead share a photograph Lover took yesterday. 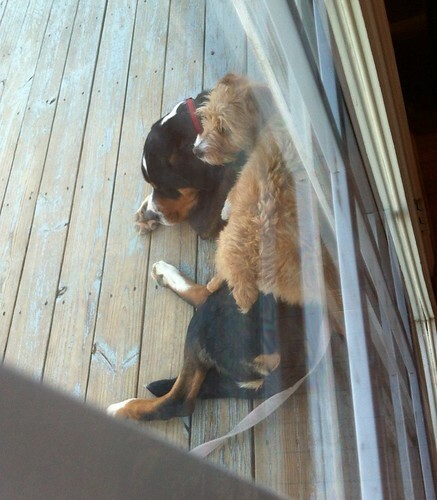 Two of our three dogs, Ginger (Banded Mountain Terrier) and Cooper (Swiss Mountain Dog). Ginger is demonstrating a canine's ability to use problem-solving and tools. In this case, she's decided to use Cooper as a dog bed. I reckon Cooper is allowing her to do this because when he gets bored, he pulls her around by the tie out until she agrees to play with him. They have hard, hard lives. I will be more coherent next week. And maybe even tackle reader questions.